The architect Aulenti has given Milan's Stazione Nord a new face. The plaza was rebuilt, organising routes in a way which centres around the pedestrian. The architectural elements and works of Claes Oldenburg and Coosje Van Bruggen have added rhythm and redefined the area. As one approaches the entrance to the Delft University of Technology Library - designed by Mecanoo (Henk Döll, Francine Houben)- it becomes clear that the library offers readers and visitors two possible forms of use: one on the inside, and the other on its roof. The Garibaldi-Repubblica project will redraw 35 hectares of urban territory, dividing it into three units: a fashion district, an office development and a tree library. It is one of those big projects that promise to transform the city of Milan, as part of the process of urban renewal that has been taking place in the Lombard capital for several years now. 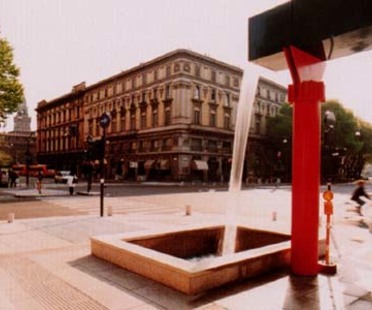 The redevelopment project for the historical landing place from which canals branch off linking Milan with the Ticino is intended to restore the area¿s nineteenth-century appearance. In the centre of Potsdamer Platz, not far from the line once traced by the Berlin Wall, the Sony Center is both an important symbol of the modernisation of the city and one of the key elements in the new urban development of the German capital. More of a landscaping project than an architectural one, the Yumebutai complex perfectly mirrors the concept of Japanese architecture in which the landscape is seen as an atmosphere in the process of becoming, rather than an object of design.